Virgin Atlantic Airlines was going around New York City at the beginning of this week, promoting their new ad, FITFOO which stands for Flying in the Face of Ordinary. This was my first example of Real Time marketing. They were tweeting from (@VAAintheUSA) with their locations while also reaching out to celebs and different companies to raise more awareness of FITFOO. 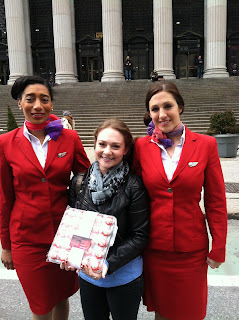 I am just a FunSized girl and Virgin Atlantic had no issue with coming to the steps of the main United States Post Office on 8th Ave to deliver their FITFOO Fun to me! I didn't know what to expect but to see a red Mini Cooper with the Virgin Atlantic logo! To my surprise, two lovely Virgin Atlantic stewardesses greeted me with a rather large container of Baked By Melissa cupcakes! I was stunned and so grateful! A photographer came along for the ride, who took a ton of pictures that will be on their Facebook page. Wednesday was their last day of FITFOO fun in NYC, they were off to London that evening. I've never been on a Virgin Atlantic flight but after this promotion that they had, I've learned more about their airlines and I am definitely more inclined now to look into booking one of their flights! Great job VAAintheUSA and thanks again! Have you taken a flight on Virgin Atlantic? What was your experience like? Tell me about it!